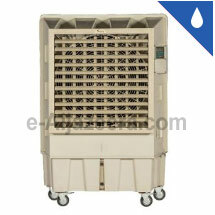 Evaporative cooling or outdoor coolers is a system that cools air through the evaporation of water or liquid. The principle of this system is that water must change from liquid state to a vapor. And this is achieved in our evaporative coolers using the honeycomb evaporative pads. When evaporation occurs, the heat is taken from the water that remains in the liquid state that resulting in a cooler liquid. That cooling effect depends on the difference between two temperatures; if the temperature have greater difference the result may greater evaporative cooling effect also. When the temperatures are the same, then no net evaporation of water in air occurs, so there is no cooling effect. An example of natural evaporative cooling is the perspiration or sweat, in which the body secretes in order to cool itself. The evaporation rate depends on the humidity and temperature of the air, which is why one’s sweat accumulates more on humid days: the perspiration cannot evaporate. Evaporative cooling is not the same principle as used by vapor-compression refrigerant units, although this process requires evaporation. In the cycle of vapor-compression, the refrigerant gas is compressed and cooled after the refrigerant evaporates inside the evaporator coils causing it return to its liquid state. 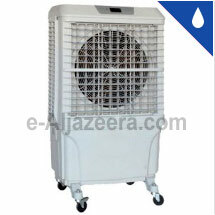 Power consumption is limited to fan and water pump. As the water vapor is not recycled, there’s no compressor that consumes most of the power in closed-cycle refrigeration and also no special refrigerants, only water. 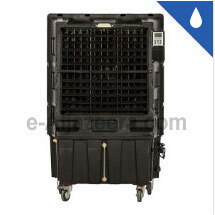 The two most basic mechanical parts in evaporative coolers are the fan motor and water pump, both of it can be repaired at low cost. In dry climates, the Evaporative cooling adds moisture and increases humidity that may maximize comfort and decrease static electricity problems. 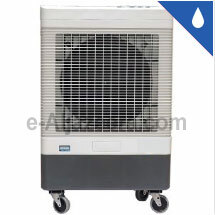 Evaporative coolers is typically 80–90% relative humidity and it require a constant supply of water to wet the pads that may able to produce cool air.